Your new show, Just Add Magic, premiered a few weeks ago on Amazon Prime. Although you’ve guest-starred on several Disney Channel and Nickelodeon shows, your character in Just Add Magic is your first lead role on a TV show. How does being a lead compare to being a guest star? What are the similarities and differences? Aubrey Miller: I love being a lead on such a fun show. There are many similarities and differences. Some differences include when you are a lead you get to work more, which is great because I love being on set so getting to go every day for months is a dream. Another thing that is different is that the cast truly becomes family. I have built great relationships with everyone whose shows I have guest starred on, but when you work with the same people every day and watch all of their characters grow together, you become even closer. Oh, and don’t forget a bigger wardrobe closet! Some similarities include [that] I get just as excited going to set and reading the script, getting my hair and makeup done, and just feeling happy to do what I love. You play Hannah on Just Add Magic, a perfectionist who’s organized, loyal, and protective of her friends. Do you share any of those traits with Hannah? What is it like to play her? Yes! I do share all of the traits you listed with Hannah and many more. We both sing, dance, and play instruments. We both love to bake and truly care and love our family and friends unconditionally. I love playing her! 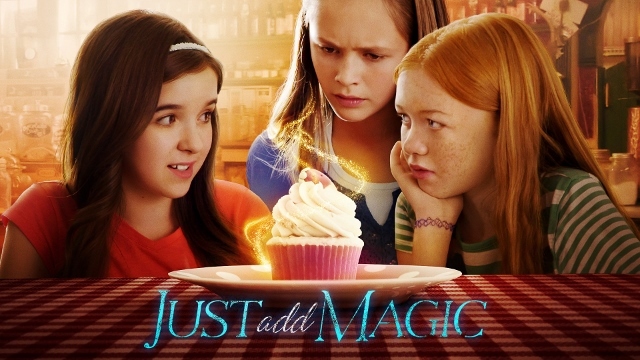 Just Add Magic was based on a book by Cindy Callaghan that came out in 2010. Had you read the book before you got involved with the show, or did you read it as part of preparing for your role? How did it influence the way you approached playing Hannah? I did not read the book beforehand, but when we booked the series, Cindy Callaghan sent us the book along with some of her others and at that point I read it. She was also on set when we filmed the pilot and she could not be happier with the way we made her characters come to life! You recently won TWIST Magazine‘s Best Look of the Week title for the outfit you wore to last month’s private screening of Just Add Magic, beating out big names like Selena Gomez, Laura Marano, and Zendaya. Congratulations! January was obviously a stylish month for you – what trends are you eager to take advantage of going into spring, and what’s your favorite item in your closet right now? Yes, it was very exciting! I wore a custom Sally Miller two-piece dress. As you can tell, I have a passion for fashion so I’m excited to see what new trends are to come this spring. I’m a total girly-girl so some things that I’m eager to wear this spring [are] lightweight summer skirts and modest crop tops with cute open backs. I often put lace or a color underneath to add to my style. My Sam Edelman fringe boots, ripped jeans, and some cute skirts and rompers are my current closet favs. Aside from acting, singing is another one of your passions. In fact, you recently put out a music video covering Megan Nicole’s Electrified. Who are your favorite musical artists right now? Any plans for putting out original music? Great question. I loved covering Megan Nicole! I’ve talked with her at several events and she is as sweet as she is talented. Some of my favorite artists include Taylor Swift, Ariana Grande (who I got the pleasure of working with), Tori Kelly, Meghan Trainor, and Christina Aguilera. I do have an original pop single coming out called Dancing With My Girls – I can’t wait for everyone to hear it. It will make you get up and dance! It is coming out very soon and it will be followed by a new music video. Stay tuned to find out when you can pre-order! Thanks so much to Aubrey Miller for chatting with us! You can keep up with Aubrey Miller on Twitter (@aubreykmiller) and Instagram (@officialaubreymiller).